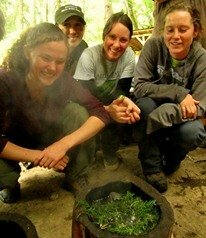 The Alderleaf Wilderness Certification Program just returned from their first class field trip of the year. This time it was a visit to the Oregon Dunes, which is a spectacular landscape of eye-popping scenery, meeting of elemental forces and excellent opportunities for wildlife tracking. These dunes are impressively huge, spanning 50 miles North to South and about 3 miles at their widest point. Such a landscape was just made for exploring! Students got to learn and practice wildlife tracking and trailing skills, ethnobotany, navigation, dune ecology and more. 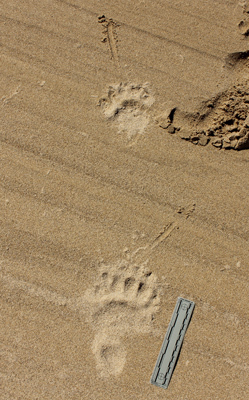 Here are the impressively large tracks (with 6 inch ruler for scale) of one of the residents of the dunes. In this case, a black bear. Wildlife tracks are abundant and diverse in the dunes and surrounding landscapes. Because of the abundant open sandy areas, its the perfect place to introduce students to wildlife tracking. 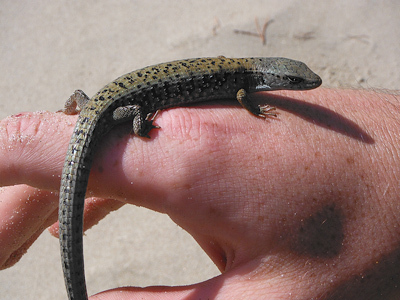 One of the beautiful and friendly residents of the dunes, a northern alligator lizard. These beautiful animals are one of the few reptiles cold tolerant enough to live in the cool, coastal climate of the Oregon Dunes. 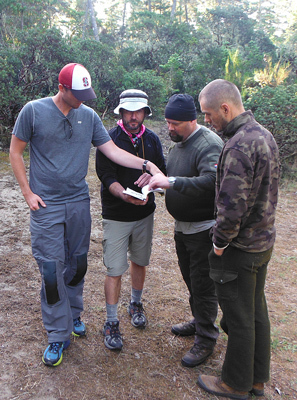 Here one of the core instructors works closely with several students - Garret, Terry and Frank - to help them identify one of the plants found in that area using Newcomb's Wildflower Guide. Identifying plants is vital knowledge for survival skills, ethnobotany and other parts of the Alderleaf curriculum. 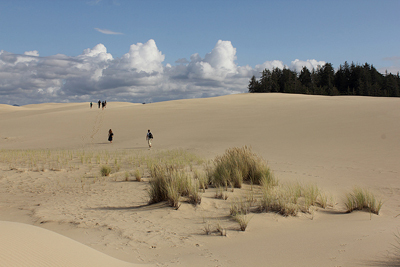 The Oregon Dunes is incredibly inspiring and is the perfect place to really bring new students together and get them excited to learn more about the natural world. We were very grateful to get to visit those lovely moving mountains of sand, the forests that surround them and the great Pacific ocean that helped form them!